Auto/Mate converts dealer’s data and installs in 60 days with no disruptions to business. Sign the contract or leave. 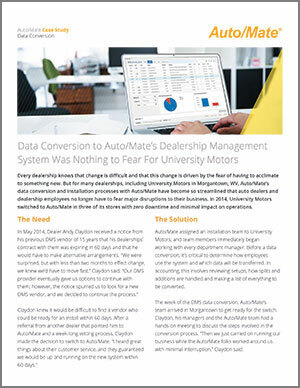 It wasn’t until University Motors received a letter from their DMS provider stating their contract was expiring in 60 days and had to make alternative arrangements that they realized they had other vendor options. But after hearing about our superior customer service from another dealer, we guaranteed they would be up and running on our system with all of its data in two months.